I’m thrilled to share that we plan to deliver the Microsoft Cloud from our first datacenter locations in Switzerland and the United Arab Emirates, and we’ll expand the cloud options for customers in Germany. I’m also excited to reveal that the Microsoft Cloud in France is officially open with the general availability of Microsoft Azure and Microsoft Office 365 today, and Dynamics 365 will follow in early 2019. By delivering the comprehensive, intelligent Microsoft Cloud – comprising Azure, Office 365 and Dynamics 365 – from datacenters in a given geography, we offer scalable, available and resilient cloud services for companies and organizations while meeting data residency, security and compliance needs. Microsoft has deep expertise protecting data and empowering customers around the globe to meet extensive security and privacy requirements, including offering the broadest set of compliance certifications and attestations in the industry. We’re deepening our investment in the Middle East with these first cloud regions, which will be in Abu Dhabi and Dubai in the United Arab Emirates. We have long-standing expertise and deep local relationships in the Middle East. We strive to combine that knowledge with our cloud services to help public and private institutions scale to meet the tremendous economic growth and technological innovation in the country and across the region. In Europe, we’re continuing to expand our substantial cloud footprint in response to customer demand and to address the needs of some of the world’s leading industries and organizations. Our engagement with financial institutions and regulators in Switzerland over the past several years has led to a deeper understanding of the market and the opportunity for locally delivered, trusted enterprise cloud services to meet their unique requirements. We intend to be the first global cloud operator to introduce cloud regions in Switzerland, which will be in the cantons of Geneva and Zurich. We are also expanding the cloud service options available with the addition of new cloud regions in Germany. This new cloud offering will complement the options currently available for customers today. The two new regions will provide enterprise-grade reliability, performance and business continuity combined with data residency within Germany and connectivity to Microsoft’s global public cloud network. In France, the Microsoft Cloud is now open to thousands of customers, partners and ISVs with today’s general availability of both Azure and Office 365. With this milestone, Microsoft is empowering organizations like Naval Energies — a global player in renewable marine energies; Astrimmo — a leading provider of housing services in France; and Ercom — a French company specializing in cybersecurity, with greater scalability, agility and the opportunity to develop new cloud-based solutions. Also starting March 14, existing Office 365 customers from France and French territories will be able to opt-in to be moved to the local cloud regions in France. Microsoft has a long history of collaborating with customers to navigate evolving business needs and has developed strategies to help customers prepare for the new European Union General Data Protection Regulation (GDPR). We’re invested to make the Microsoft Cloud GDPR compliant when the regulation becomes effective on May 25, 2018, delivering innovation that accelerates GDPR compliance, and building a community of experts to help customers along their full GDPR journey. 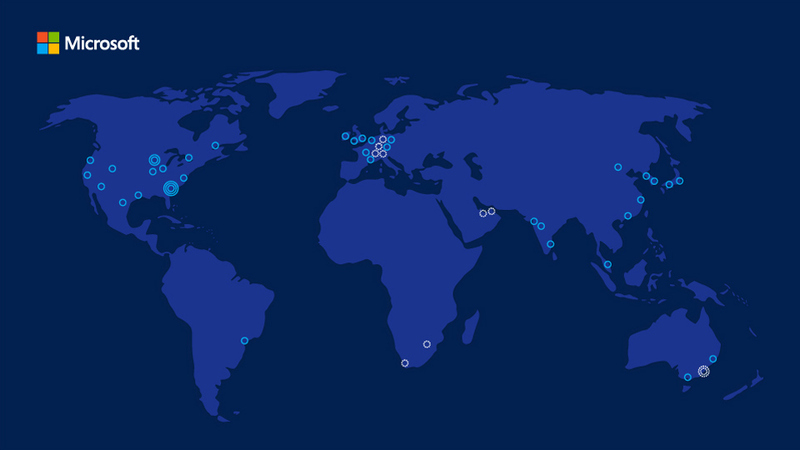 Over the last three years, we’ve more than doubled the number of Azure regions available. As of today, Azure has more regions than any other cloud provider. We’ve announced a goal to be in 50 regions across the globe, including plans for 12 new regions. Office 365 and Dynamics 365 also continue to expand the data residency options for customers with 17 geographies announced. The two products are the only productivity and business application platforms that can offer in-geo data residency across such a broad set of locations. Each datacenter geography, or geo, delivers a consistent experience, backed by robust policies, controls and systems to help keep data safe and help comply with local and regional regulations. You can learn more about our transformative cloud solutions at Microsoft Azure, Office 365, and Dynamics 365, or follow these links to learn more about today’s announcements in France, Germany, Switzerland and the United Arab Emirates.